Comprising fifty-eight examples in manuscript or printed editions, Painted Prayers: Medieval and Renaissance Books of Hours from the Morgan Library examined the tremendous popularity of Books of Hours through an exploration of their customary prayers and the beautiful pictures that traditionally accompany these texts. For three hundred years, from about 1250 to 1550, more Books of Hours were commissioned and collected, bought and sold, given (and stolen), bequeathed, and inherited than any other type of book, including the Bible. The Book of Hours has rightly been called the "bestseller" of the late Middle Ages. The reasons behind this popularity are revealed by the inspiring textual and dazzling pictorial contents of the Books of Hours in this exhibition. When printing was invented in the mid-fifteenth century, presses churned out thousands of copies in hundreds of editions and put Books of Hours into the hands of a new and even larger audience. As prayer books whose devotion centered on the Blessed Virgin Mary, Books of Hours offered the literate lay public direct, democratic, and potentially unceasing access to God, Mary, and a panoply of saints. The immense popularity of Books of Hours derived from their pictures as well as their texts. Pleasing to the eye, these images played a practical as well as a pietistic role—they marked the beginning of important texts and, as depictions of saints and the lives of Christ and the Virgin, they aided in meditation. Presenting the Library's most beautiful illuminations and finest examples of printing, the exhibition allowed visitors to "walk through" a typical Book of Hours. The first section focused on Calendars, the first part of any Book of Hours; the second section was devoted to the four Gospel Lessons; the third to the Hours of the Virgin, and so forth, ending with the Office of the Dead. 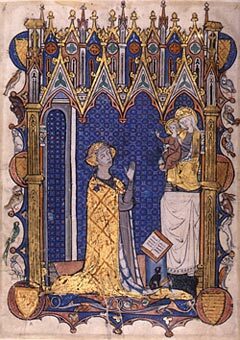 "Psalter-Hours of Yolande de Soissons"